The difference between ruby and pink sapphire is whether red is the dominant hue. The two stones are almost identical because both gemstones are composed of corundum, a variety of aluminum oxide(Al2O3). Rubies are inherently red, and sapphires are any other color. However, rubies can have pink, purple, or orange undertones. The dominance of undertones determines whether the stone is a ruby or a pink, orange or purple sapphire. Anything that isn’t classified as “red corundum” is a sapphire. In theory, anything that isn’t classified as “red corundum” is a sapphire. However, in practice, this trait is hard to define because our perception of color is subjective. Remember the viral online debate of the blue/black or white/gold dress? Gemologists have a difficult time defining the moment a stone’s color slips from being mostly red with a shade of pink or mostly pink with a shade of red. The difference between ruby and pink sapphire all depends on how the gemologist perceives color. Is Pink a Shade of Red? Originally, the main debate on whether rubies can be pink revolved around whether pink is a form of the color red. The color pink is red and white mixed together, so in essence, the color pink is a form of red. Does that mean that all pink corundum is essentially red corundum? Not quite. Over time, the color pink became a unique color. However, the point when a shade transitions from being dominantly red to dominantly pink is subjective. 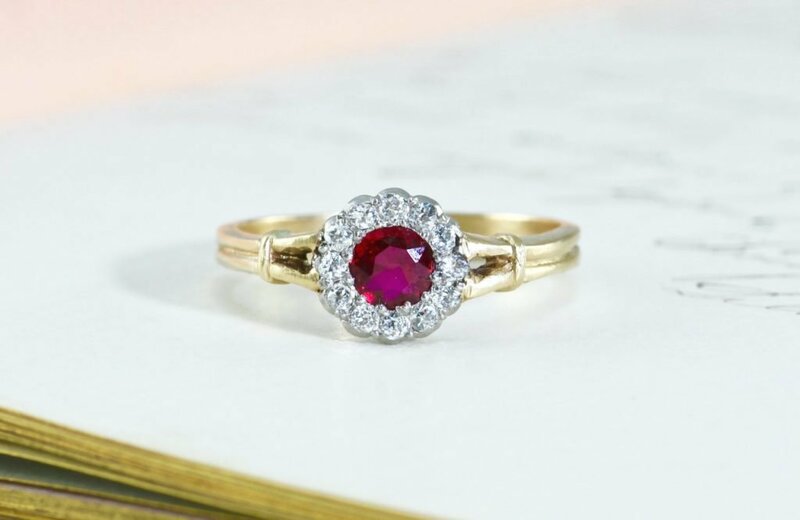 According to the GIA, red must be the dominant hue for corundum to be considered a ruby. When you look at the stone, you must see more pure red than you do any other color. Trace amounts of chromium cause a reddish color in corundum. The amount of chromium and other trace elements will determine the purity of the red shade. The more chromium present, the redder the stone will appear. Lesser amounts of chromium will make the stone pinker. The most difficult stones to grade are the ones that have a mid-range amount of chromium. The color undoubtedly falls in between red and pink. Other colors and undertones are produced by trace elements like iron, titanium, and vanadium. The most valuable ruby color is known as pigeon’s blood. It is a pure form of red with no discernible undertones. Burmese rubies are generally pigeon blood red and are considered high quality. Not all pink sapphires are difficult to grade because some shades of pink are quite different than most rubies. 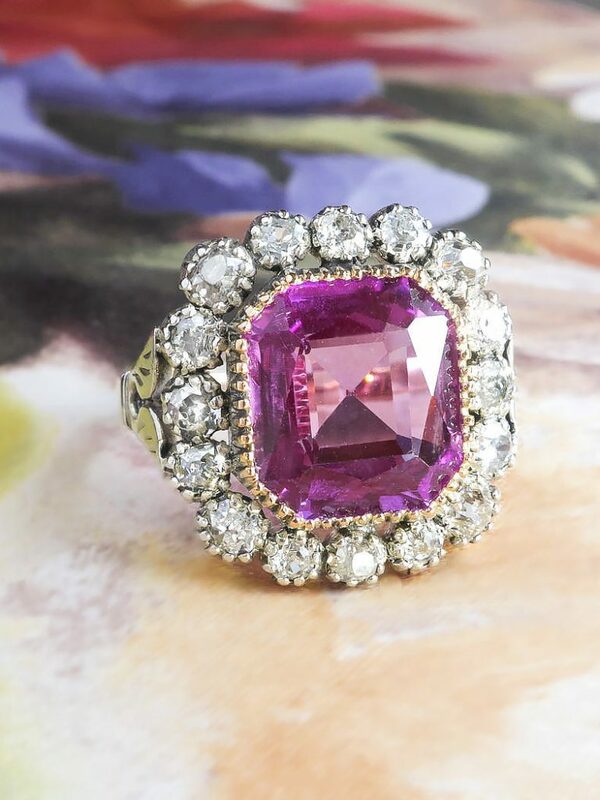 There is a treated shade of hot pink sapphire on the market that has no resemblance to a red ruby. Some lab created and natural pink sapphires are light enough to be easily categorized. Next time you’re on the fence about whether your stone is a ruby or a sapphire, remember that if it’s another definable color like light pink or bright orange, it’s most definitely a sapphire. If it’s hard to tell whether the stone is more red than pink or redder than orange, your guess is as good as mine. When in doubt, send off for certification. Regardless, the result on borderline stones is subjective. Your best bet if you can afford it is to buy a natural, untreated stone in a color you like — regardless of what it’s called. FAQ: What Does the Word Filigree Mean? Lauren Thomann founded the blossoming vintage jewelry business, Ageless Heirlooms, in 2006. She has spent the last decade dealing in and educating herself on estate fine jewelry. This site contains some affiliate links. In the event of a sale, I may receive a small commission at no extra cost to you. What is a “Toi et Moi” Ring? @2019 - Ageless Heirlooms. All Right Reserved.